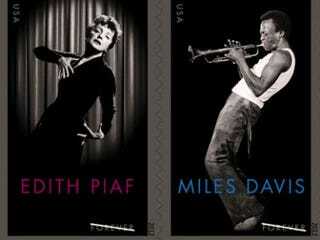 Jazz musician Miles Davis will be honored with a U.S. postal stamp, according to the Hollywood Reporter. The man who played the trumpet like no other will be honored with French singer Edith Piaf. "On behalf of the Miles Davis family, we are honored that the U.S. Postal Service and La Poste are paying homage to the timeless legacy of Sir Miles Dewey Davis," said Cheryl Davis, Erin Davis and Vince Wilburn Jr. — Miles' daughter, son and nephew — in a statement. Davis, who died more than 20 years ago, appears on the stamp in a black-and-white motif. It will be released in June.